Is Pain Management Right for You? A lumbar spinal brace is a medical product your doctor prescribes to support your low back, reduce pain, or keep your spine stable and may be recommended for conditions such as Scheuermann’s kyphosis. The type of brace your doctor recommends is based on your diagnosis and treatment plan. A low back brace may be combined with other non-surgical treatments such as a muscle relaxing medication and physical therapy. If you undergo lumbar spine surgery that includes fusion, it may be necessary to wear a brace to help you heal. Your doctor provides instructions covering how to put the brace on, when to wear it, how long each day, and treatment duration; a few weeks or months. He will explain to you why you need to wear the brace and potential benefits. Soft lumbar corsets provide short-term low back muscular support and may help relieve pain. These braces do not completely immobilize the low back. 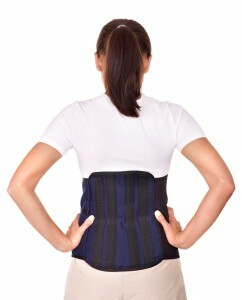 The corset helps you avoid movements that can aggravate back pain such as bending or twisting. Your doctor may recommend you wear the brace only while engaging in certain activities that put your low back at risk, such as gardening or housekeeping tasks. Brace treatment usually includes physical therapy or a rehab program to build your core strength. Core strength refers to the strength and flexibility of the muscles that support and protect your low back. After lumbar spine surgery, a brace provides temporary low back support and prevents muscles from quickly tiring out while you heal. The brace can serve as a reminder that certain activities should be avoided or performed with caution. A lumbar corset does not prevent low back injury. Your doctor or physical therapist can teach you safe ways to move to help prevent back injury, such as getting in and out of a car. Rigid lumbar braces are made from materials that restrict movement or completely immobilize the low back. This type of brace may be prescribed to manage vertebral compression fracture that is inherently stable, after spinal instrumentation and fusion or following complex low back surgery. Although spinal implants (internal fixation) secure the spine, bracing can help prevent micro-motion, thereby assisting bone and soft tissues to heal. An Orthotist is a brace specialist trained in anatomy, biomechanics, physical science, materials engineering, and related fields. Some types of braces require an Orthotist to fit the brace. Under your doctor’s guidance, the Orthotist fine tunes the fit and comfort to help you achieve your treatment goals. Your treatment plan may prescribe you wear your brace when performing certain tasks, immediately upon getting out of bed, or a few hours a day for weeks or months. To fully benefit from brace treatment, it is important to follow your doctor’s recommendations, which may include physical therapy and a strength-building program at home. Have You Been Told You Need Spine Surgery? Contact Dr. Gary Kraus, MD, a neurosurgeon in Houston specializing in non-surgical, spine surgery and minimally invasive spine surgery, with offices in the Woodlands and Kingwood areas and Humble. Gary Kraus, MD, Neurosurgeon, is Board Certified by the American Board of Neurosurgery and Fellowship Trained. He has special expertise in non-surgical and minimally invasive treatment.